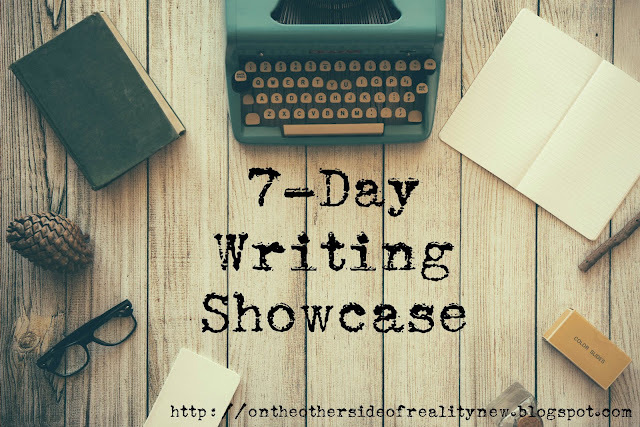 7-Day Writing Showcase, Day 1: "The Gates of Amoun" by Clara! Hey, young bloods! Today is the first day of the 7-Day Writing Showcase, a week where every day I post a story by an amazing writer in the comm in order to highlight all the amazing talent out there! To kick off the week, I'll be presenting a story by the amazing Clara, called "The Gates of Amoun". I hope you enjoy! I stared at the seashell in the palm of my hand. It’s soft green color and the soothing sound had always comforted me. It was the most beautiful thing in Amoun. Amoun was a dark place, filled with smog and dust. The city was filled with factories, with only a little space left for the homes of the Amounites. Half of that space was filled with my father’s mansion. The town was also extremely boring. I longed for something to happen, something that would give me a chance for adventure. My father knew what adventure was like. He was the founder of Amoun, the only one here who had seen the outside world. I’d ask him about it, but he never really told me anything significant. I’d rant about how we needed schools. I wanted to read. I knew he never really listened, though. He’d just keep nodding and saying, “Indeed.” I had given up. He had things many of us had never seen, like books. He could read them, too! None of us could read. We didn’t have a school because all the children were in the factories. The only thing that was the least bit interesting was when the trucks came. On the last Thursday of each month, excitement stirred through the town. The men of Amoun would all crowd around the expansive gates, working together to swing them open. Then the trucks would rumble in, belching out great puffs of black smoke. The men would load up hundreds of crates and boxes filled with all the things we made in the factories. All the Amounites would run out of their houses, pushing and shoving to get a better look. Sometimes something would fall from the backs of the trucks, some forgotten tidbit often too small to be noticed. If someone saw it fall, there would be a scramble as everyone tried to grab the small keepsake from the outside world. My seashell had come from the trucks. I’d seen it fall, then quietly slipped it into my pocket instead of causing a commotion. No one else seemed to think of that. I traced my finger along it’s sharp edge before setting it back on my shelf. I’d had enough of Amoun. The seashell proved the outside world was there, it was waiting for me. There were other towns out there somewhere, towns with beautiful things like my shell. Towns with schools and books. And I planned to find them. Pulling on my shoes, I slipped out the door and clicked it shut behind me. As the sun began to sink, I quietly snuck through the alleys between the small houses until I came to the thick fence surrounding the factories. I began to climb as I’d done many times before, my fingers gripping the wire tightly until I was safely on the ground again. Then I waited in the shadows by the factory that Elias worked in. It seemed like hours before he finally came, in a long line of dirty, coughing children. We both headed away, back to our homes for the last time. Morning dawned bright and cheery, the exact opposite of my mood. When I awoke, my hands were trembling and I was dripping with sweat. Pull yourself together, Scarlette. You can’t chicken out now. With that comforting thought, I pulled on my clothes and slung my bag over my shoulder. I paused at the door, glancing back at the expansive portrait of my father over the mantel. “Goodbye, Father.” The door clicked shut behind me. We pushed our way through the crowd until we were right next to the gate. Elias gripped my hand tightly as we edged out, staying in the shadow of the truck. Then we were out, and we began to run. My feet pounded on the ground as we dashed away from Amoun. I gripped my shell tightly in my hand. The world was ahead of us. We were free. I hope you all enjoyed reading that! I know I did :) Check back tomorrow for a piece from another awesome writer, and have a great day! Wow this is so great! I had no idea Clara was a writer! Great writing! This is so very well done! :) Talk about vivid imagery for a short story. And it's a neat, original idea to boot (I personally have a habit of using cliches, though I do find it kind of fun writing them). Nice work, Clara!